This wildly entertaining and spectacularly funny homage to Jazz Age musicals has lyrics by Lisa Lambert and Greg Morrison and book by Bob Martin and Don McKellar. Amongst the show’s numerous Tony® Awards are Best Book and Score. When show narrator Man in Chair plays for the audience a record of his favorite 1920s musical, The Drowsy Chaperone, the show bursts to life in his living room. Lovingly spoofing old musicals, The Drowsy Chaperone features a comic cast of characters involved in a delightfully silly series of misadventures. Amongst the cast are a Follies girl seeking true love, her attractive but dim groom-to-be, a chaperone who likes to tipple, an over-the-top Latin Lothario, a hapless best man, and a Follies producer harassed by two “punny” gangsters. Craig Gustafson is directing, assisted by Toria Hollyn. Genevieve Pastore is the production manager. Sue Kinney-Watschke is the musical director and Tracy Adams is the choreographer. Debbie Trueblood is stage manager. 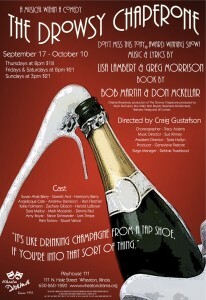 Performances of The Drowsy Chaperone are September 17 through October 10, 2010. Shows are Thursdays, Fridays, and Saturdays at 8pm and Sundays at 3pm. Tickets are $21 each, except Thursdays, which have a special price of $18 per ticket. The Drowsy Chaperone is presented by special arrangement with Music Theatre International.